Most PC users know that to speed up an old system, you need to spring for new hardware: RAM, a graphics card, or a CPU. If you're not ready to make an investment and crack open the case, however, system-cleanup utilities are enticing. They promise to pry off all the digital barnacles that have collected on your PC and on Windows, remaking it into the spry system you remember from the day you first set it up. But do cleanup utilities really improve system performance? Or are they the digital equivalent of a placebo (your PC only seems faster because you've invested $40 and a half hour on a utility, and you don't want to think you've wasted your money and time)? The PCWorld Labs tested such programs to settle once and for all whether they significantly speed up computers. We dug up five well-used PCs of various specs and generations, and ran four popular Windows cleanup utilities--Ashampoo WinOptimizer ($40 for version 7), Iolo System Mechanic ($40 for version 10), Piriform CCleaner (free), and 360Amigo System Speedup (free version)--on all of them. The result? In most cases the cleanup utilities scarcely made a difference in overall system performance, and in a few instances they actually made things slower--though they did shave a few seconds off the test machines' startup times. Read on for our in-depth findings. Obviously, we couldn't use pristine PCs to test the utilities, since they wouldn't have any crud to clean. So we collected five systems of different ages that had one thing in common: wear and tear. The test PCs were a Dell Latitude D520 laptop (1.66GHz Core Duo T2300, 512MB RAM, Windows XP Professional 32-bit), a Dell Inspiron E1505 laptop (1.6GHz Core Duo T2050, 1GB RAM, Windows Vista Home Premium 32-bit), a Lenovo ThinkPad Edge laptop (1.3GHz Core 2 Duo U7300, 4GB RAM, Windows 7 Professional 32-bit), a Toshiba Satellite M645-S4055 laptop (2.4GHz Core i5-M450, 4GB RAM, Windows 7 Home Premium 64-bit), and a custom-built desktop that we frequently use in the Labs (2.4GHz Athlon 64 4000+, 3GB RAM, Windows XP Professional 32-bit). Each of these five PCs had endured months, if not years, of frequent usage without even a light dusting, much less a comprehensive system scrubbing or Windows reinstall. In short, they were exactly the kind of PCs that most people would want to run a cleanup utility on. First, Tony Leung and William Wang of the PCWorld Labs preserved each computer's precleanup state as a disk image; then, they ran WorldBench 6 on the systems in the precleanup state to obtain a baseline performance score. Next, on each computer, they ran one of the cleanup utilities through its standard functions three times, to make sure that it didn't miss anything. They didn't uninstall any applications, even if the utility recommended doing so. (Getting rid of software that you no longer need is a good way to speed up a PC, but we wanted to see whether the other functions performed by each cleanup utility would make a difference with the same software lineup.) Afterward, they ran WorldBench 6 again to determine whether performance had improved. Then they restored the system to its original, cluttered state and started the process over with another cleanup utility. Note: The testing process took weeks. All of the cleanup utilities we evaluated for this roundup have since been updated, so it's possible that retesting with the current versions of the programs would yield slightly different results. Judging by their overall WorldBench 6 scores, none of the PCs performed notably better after we ran the utilities. In fact, only two systems saw score increases at all after we ran a cleanup utility, and those increases were only a single point (CCleaner, System Speedup, and WinOptimizer 7 each produced a one-point bump on the Dell E1505, and WinOptimizer 7 did so on the Lenovo ThinkPad Edge). Most of the tests produced scores that were either identical to or slightly lower than that of each PC's original configuration--not quite what you'd expect from performance-boosting utilities, considering that a one-point gain in WorldBench 6 is small enough to be within the margin of error. However, the test results for individual applications yielded a few more-interesting tidbits. 360Amigo's System Speedup seemed to have a problem with Microsoft Office. For each of the test PCs except the Dell E1505, Office performance grew noticeably worse--over twice the test time, in some cases--after we ran System Speedup. This issue with Office accounts for the dramatic drop in some of the WorldBench 6 scores. Aside from the Office test, though, System Speedup's results weren't that different from the others. Some of our PCs were more heavily affected by cleanup utilities than others. For the Toshiba M645-S4055, performance didn't change by more than 10 or 15 seconds in any given WorldBench 6 test--not surprising, considering that it was carrying the most powerful hardware. The Dell E1505, with the poorest specs of the bunch, saw more-dramatic differences, both good and bad, in specific tests with each cleaning utility (photo editing ran about 10 percent faster, creating and saving a DVD image ran about 20 percent faster, and video editing in VideoWave ran about 5 percent slower). So even though we didn't find substantial differences overall, your older PC might have a particular problem that one of these utilities can fix. There are no one-size-fits-all PC fixes. After running each utility, the Dell E1505 saw a big speed improvement with disk-intensive tasks such as writing DVD images. In contrast, the Labs' custom-built desktop did worse in that respect: An 8-minute test took about 20 seconds longer after running CCleaner, System Speedup, and WinOptimizer 7; and it took a whole minute longer after running System Mechanic 10. The Dell D520 had slightly slower speeds in that task as well. This seems to mean that even if a utility made one PC run better, it might not necessarily help yours--and it could even make your PC's performance slightly worse. Although we ran each cleanup utility three times before running WorldBench 6, some utilities still found items that needed cleaning each time. We don't know what caused this; the utilities might have encountered problems they couldn't fix, or the cleanup process might have created other problems elsewhere. For comparison's sake, we also tried uninstalling 49 applications (using WinOptimizer 7's uninstall feature) from the Lenovo ThinkPad Edge, running WinOptimizer 7's cleanup functions, and then running WorldBench 6. We found an improvement of three points in WorldBench 6 (from 60 to 63, or 5 percent)--a larger increase than anything we saw from the standard cleanup functions. While such a result won't make your PC like new, it will make multitasking and disk-heavy operations a bit less painful. 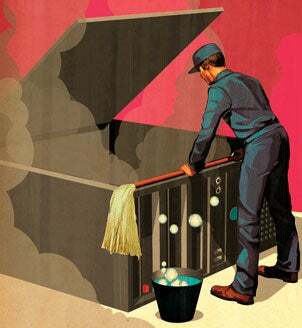 To sweep away system clutter, uninstalling old programs is your best bet.